Education is a basic right for all children in the United States. With legislation aimed at the inclusion of all students comes the drive to ensure equitable access to grade-level standards. Academic standards are educational targets outlining what students are expected to learn at each grade level. Teachers ensure that students work toward grade-level standards by using a range of instructional strategies based on the varied strengths and needs of students. For some students, accessibility supports are provided during instruction and assessments to help promote equal access to grade-level content. Read more about Accessibility Supports - Accommodations. . .
Get info about the conference here. In light of concerns expressed by the educational community, the Indiana Resource Network (IRN) developed a document sharing information regarding accommodations and assessments. >> This FAQ document answers common questions about the recent changes to the Behavioral Concerns section of Indiana IEP. The Accommodations vs. Modifications Comparison Chart (9.10.2018) can be used to build capacity regarding the differences between accommodations and modifications. The chart can also be used to evaluate the type of accessibility supports that students are provided or may be provided during instructions and assessments to help promote equal access to grade level content. 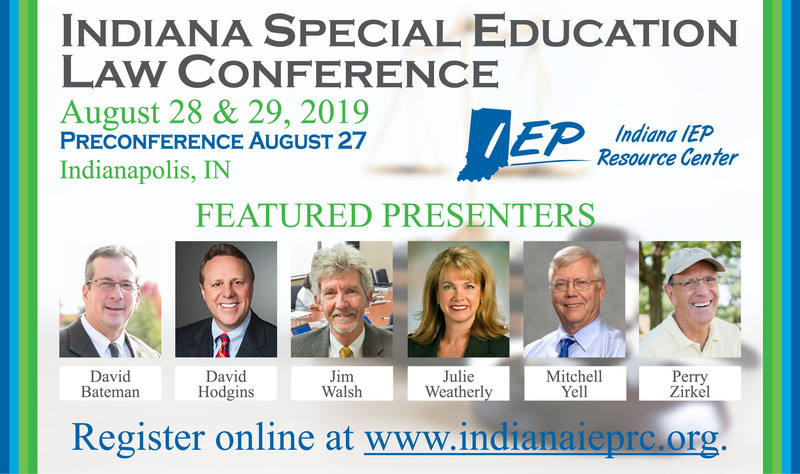 The purpose of this document is to help define and increase the capacity of understanding about specially designed instruction as it relates to students with disabilities in Indiana. This document serves as guidance for IEP teams, administrators, educators and practitioners as they determine the need for, plan, and implement Specially Designed Instruction (SDI) for students with disabilities who require an Individualized Education Program (IEP). A Facilitated IEP (FIEP) is an option available at the request of schools and parents for conflict prevention and resolution. This service is provided at no cost to parents or schools. A trained impartial professional (facilitator) helps the case conference committee with the IEP process. Least Restrictive Environment (LRE) is based on the premise that the general education environment is the first choice for educating all individuals. As described in IDEA, individuals with disabilities must be educated with their peers to the maximum extent appropriate and removal of children with disabilities from general education should only occur when education cannot be achieved in the general education environment even when supplementary aids and services are provided. This page includes guidance and additional information in regards to LRE. We partner with family support agencies and work to provide resources to help parents understand the IEP process. Virtual Office Hours (VOH) is an open webinar for anyone with questions about the Indiana IEP (IIEP) System or special education. VOH provides direct access to our Indiana IEP consultants. Our staff will share updates and upcoming changes to the IIEP system while answering your questions. If you have a specific question, you can reach our consultants directly.